Hola Amigos! Did you know that without regular physical activity, the body slowly loses its strength and ability to function well? Active living means including physical activity in your daily life. You don’t need to spend hours at the gym to be an active person. Active living could mean just making small changes in your daily life, like walking to the store or to the gym, taking the stairs instead of the elevator at the mall etc. Any physical activity is proven to improve both mental and physical health. It tackles anxiety, depression and anger. #ActiveAugust is here to make you feel good and improve your health. Be more active today! Fuel up with these healthy yellow recipes once you've finished your workout. Rinse pumpkin seeds in a colander. Spread evenly on a baking sheet and allow to dry for 1 hour or longer. Preheat oven to 275 degrees F.
Toss the seeds in the chili powder and lime juice. Add salt if necessary. Place the seeds back on the baking sheet and cook for 15 to 20 minutes. Remove from the oven, and allow to cool on a plate. Add all ingredients to a medium bowl. Mix well. Pour into stainless steel popsicle molds. Freeze for 5 hours or until solid. Blend all the ingredients together until smooth. Enjoy! Blend everything together using a whisk, and serve with vegetables. 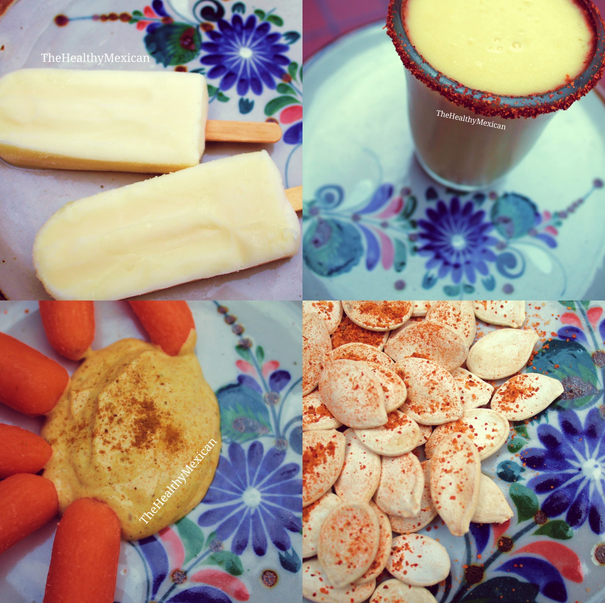 These easy and healthy yellow recipes are part of a series of monthly posts by Valentina M. Follow her on Instagram @thehealthymexican9 and on PumpUp @thehealthymexican. Do you roast your pumpkin seeds? Keep doing you. They contain tons of heart-healthy magnesium, zinc, vitamin E, plant-based omega-3s, fibre, and are rich in beta-carotene and other antioxidants. Translation: pumpkin seeds are pretty good for you! Shake them around every so often when you bake ‘em, or they burn. Thank you PumpUp member rach_kess for the photo!